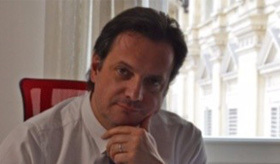 Massimiliano Margarone, CEO of SPX Lab, was confirmed as Vice President of the Italian Information Engineering Committee for the coming year, during the assembly held in Rome on July 13th at the CNI. 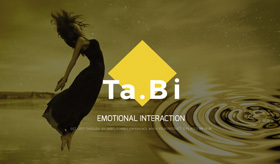 Ta.Bi website is online, created internally by our creative department in perfect synergy with our team of developers, it is made to describe the magical surface that comes alive when it gets in contact with an object. Ta.Bi is the new frontier of storytelling for brands and specific items. By touching the object Ta.Bi opens the doors of a whole new sensory dimension which cast a new light on the way the story behind the product is told. The website, which wants to be a showcase for this innovative meeting between material and immaterial, is resolved in an elegant one page completely responsive, within a minimal layout enriched with evocative images. 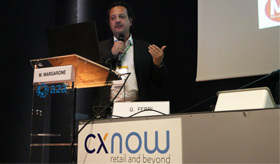 On June 20th, the key event on Smart Retail and Customer Experience: CX NOW Retail and Beyond, was held at the Fondazione AEM in Milan, where we were present as sponsor. Our CEO, Massimiliano Margarone, held an intervention on how the selfie trend has been transformed by Spx Lab into an engagement tool to improve the user experience in stores and commercial spaces, with the aim of gathering together important data for brands and sponsors. ME The Selfie Machine, the tool that combines all of this functions, was active in the exhibition area adjacent to the conference room, collecting 30 selfies in 9 hours and showing some of its important marketing features, such as Instant Win contest and the possibility to offer targeted surveys. The fifth edition of the editorial Goodstyle Magazine, a luxury magazine dedicated to lifestyle and luxury trends, has been released this month. In the last edition there was an article dedicated to Spx Lab and its mission, with an interview held by our CEO, Massimiliano Margarone. The fifth issue of the magazine which sees SPX Lab partner of the project was presented at the Party Inside the Sea event at the Tombolo Talasso Resort in Livorno, in partnership with Marchesi Antinori. 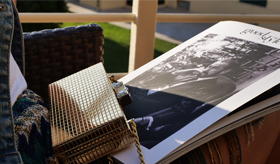 During this edition the magazine showed an interview to the actor Marco Giallini, and other overview on projects icons of style and prestige, from architecture, to tourism, to yachts to jewelery and fashion. On May 30th and 31st we've been guests in Geneva for the most prestigious event of the Business Aviation in Europe, Ebace2018. 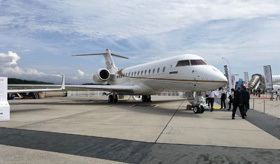 The EBACE2018 event presented 54 aircraft on the Geneva airport runways, including commercial flights, turboprop aircraft and helicopters; and it was also an occasion to present the launch of some aircraft, among presentations, networking and workshops to discuss aviation chances and innovations. The event was an opportunity to grow and get to know the careers and opportunities offered by the market and their evolution. On May 17th took place the Cocktail Party 'Royal Style', an event created by the luxury magazine Goodstyle Magazine in partnership with Spx Lab, Auleum, and Marchesi Antinori in the wonderful terrace of the Café de Paris in Place du Casino. The party was attended by models, stylists, entrepreneurs, and authorities from the Principality of Monaco, in perfect harmony with the prestigious and refined climate of Monte Carlo Fashion Week which took place in its sixth edition. During the days of Friday 18th and Saturday 19th we were present at fashion shows at the Chapiteau de Fontvieille Fashion Village, where designers and international brands, including important names from the Italian sartorial tradition, showed their creations by putting ethics and sustainability at the center. 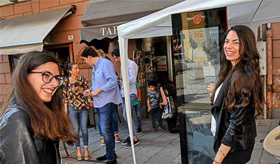 From May 25th to May 27th ME was installed in Imperia during the Book Fair of Imperia, a cultural event attended by important guests such as authors, journalists and celebrities from the broadcast scene. Together with the proposal of Instant Win which convey the possibility to win shopping vouchers from Mondovicino Outlet Village was also held a poll in order to gather the opinions of the participants, it was asked in which place people loved reading the most. Even in a less recreational context such as that of the Fair dedicated to literature, ME managed to convey the principles of sharing and entertainment, involving and entertaining the people at the event and gathering hundreds of organic contacts. 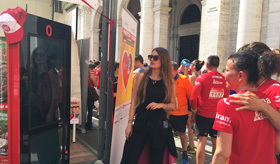 From May 25th to May 27th ME The Selfie Machine was active at the Stragenova, a famous running marathon taking place in the Ligurian capital. Almost 200 selfies were taken during the three days of the event, especially on Sunday, when the marathon was held. ME has entertained participants and tourists with its call to action 'shoot and share'. A survey has also been proposed in order to express a personal opinion on the real meaning of 'running' if it means wellness, entertainment or competition. The sport context of the marathon has created a context of great energy and fun where ME has perfectly conveyed the values of participation and sense of belonging, giving the opportunity to share their experience on social networks. 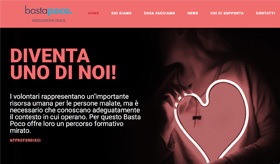 We are proud to have contributed to the digital growth of "Basta Poco" non-profit organization, making the restyling of their website and collaborating in the management of the social channels. Basta Poco is an organization born in Liguria, committed to supporting people in advanced stage of disease and helping people around patients, inform, and organize various activities of support and solidarity. The new web site wants to enhance the mission and initiatives organized by the non-profit organization, making it easy and intuitive to donate, stay updated on fundraising events and become part of the volunteer network. The launch of the new website has been also quoted on Savona News, where it's been told about the new digital growth policy adopted by the non-profit organization in order to reach more people and thus expand the network of donors and volunteers. The next event sponsored by Basta Poco will be the Festival which will be held from June 22nd to 24th in Villa Franca Park in Garlenda, with a program full of initiatives. The past weekend in Sicily started the 'Volotea Sicilia Tour', new marketing campaign by Volotea to promote the new flight destinations from Sicily. Spx Lab has thus inaugurated the collaboration with the Spanish airline, in partnership with Smart Sport. ME The Selfie Machine will be with the Volotea team among the most beautiful squares of Sicily entertaining users with the option 'shoot and win': the lucky ones after having taken their picture could discover of winning some of the many Volotea prized, such as € 50 "MEGAVOLOTEA" cards, discounts and tickets, by scratching their own photos. ME The Selfie Machine Instant Win option is the key to this promotional campaign, combining fun with the chance to win, huge call to action for the public.